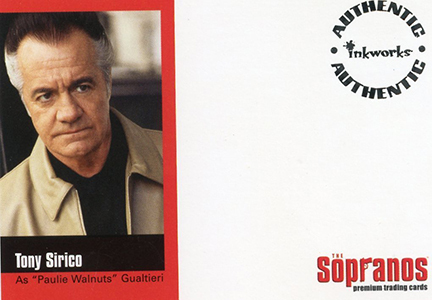 Just as The Sopranos is regarded as one of the greatest television shows of all-time, one could argue that the 2005 Inkworks Sopranos Season 1 trading cards were one of the most disappointing. But that's not to say the set is bad. Once you get past the autographs, it's actually a very strong set. It offers an in-depth look into the show's premier season with premium-style foil cards throughout. 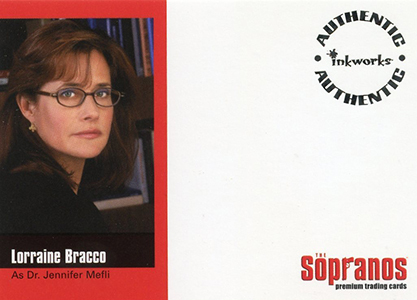 The 2005 Inkworks Sopranos Season 1 base set has 72 cards. It starts off with a comprehensive list of character profiles. 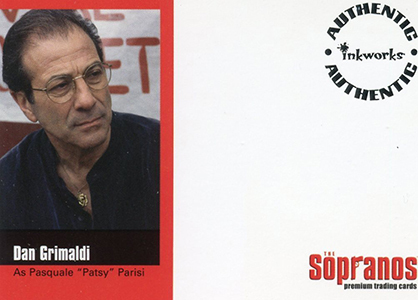 The 13 first season episodes are summarized with three cards each. Additional cards go behind the scenes and offer a glimpse at a deleted scene. All cards are done in foil, much like the card maker did with their Alias line. Autographs are inserted one per box. But this is where the set is a major letdown. For starters, the list of signers is missing most of the key cast. 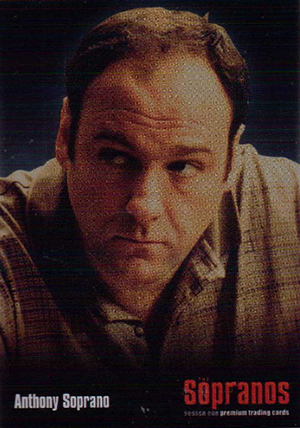 The best card is Jamie-Lynn DiScala who played Tony's daughter, Meadow Soprano. The rest of the pack-inserted autographs are supporting cast members. 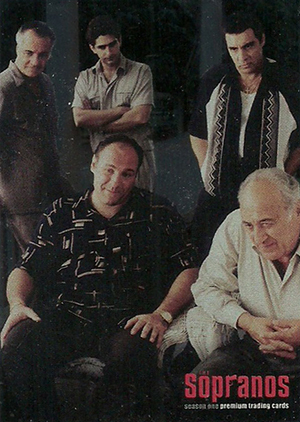 No James Gandolfini, no Edie Falco, none of "the family." To make matters worse, all of them were distributed via redemption. 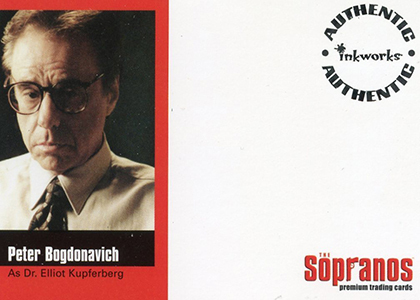 With Inkworks long out of business, there's no hope of getting an autograph from a sealed box anymore. Overall, box prices have dropped accordingly. 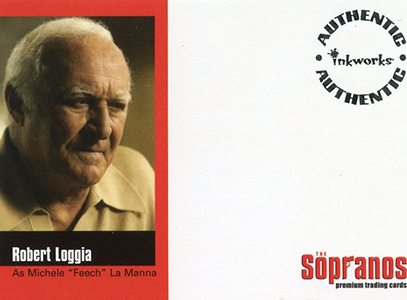 After the set was released a previously unannounced Dominic Chianese autograph was given to dealers as a case incentive. 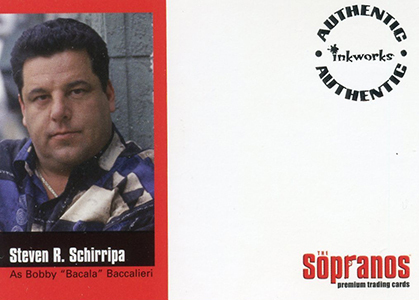 In the years since Inkworks went out of business, a series of unsigned autograph cards has surfaced as well as an autographed Robert Iler (Anthony Soprano Jr.) card. You can learn about these by clicking the tab at the top of the page. 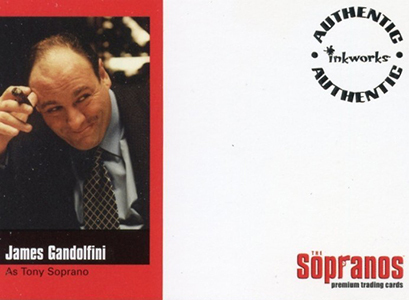 2005 Inkworks Sopranos Season 1 fell into the same pattern many of the company's other sets have. A nine-card foil puzzle, titled Family Matters, is inserted 1:11 packs. La Belle Donne, a six-card chase set that falls 1:14 packs, looks at the leading ladies of the show. 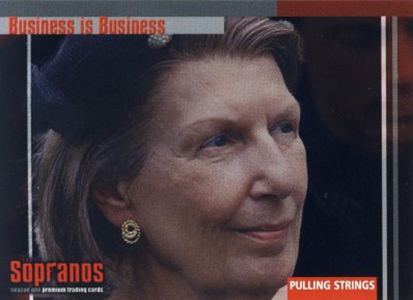 Every sealed box also has one of three Business is Business Box Loader cards. 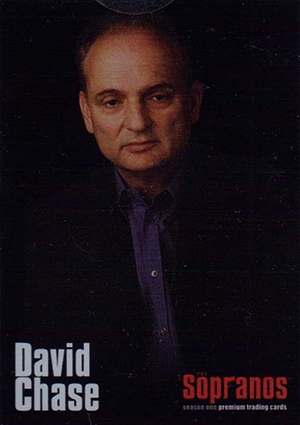 The set is rounded out by a case loader of the show's creator, David Chase. 8 cards. Inserted 1:24 packs. All available via redemption. Note that redemptions can no longer be redeemed. 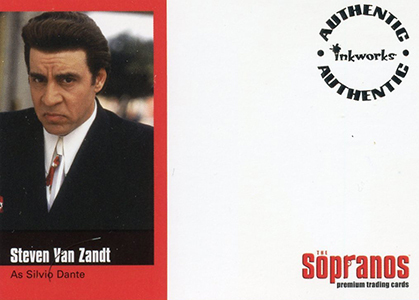 Chianese given to dealers after the set was released as an incentive card. 9 cards. Inserted 1:11 packs. Cards fit together to form a collage puzzle. Inkworks also so an uncut sheet #/199 separately. 6 cards. Inserted 1:14 packs. 3 cards. Inserted one per sealed box (not in packs). 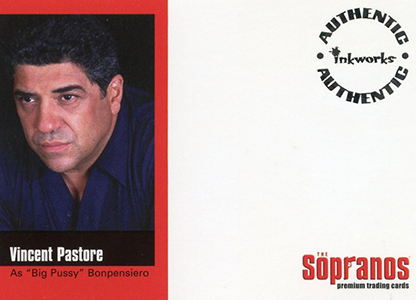 After Inkworks went out of business, a few additional Sopranos cards surfaced that were never officially released. One was an autograph of Robert Iler who player AJ, Tony's young son. 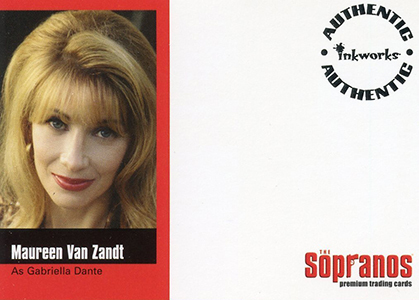 There are also 12 unsigned autograph cards, including nearly all of the key cast members. All of the cards are now available on the secondary market. All are unsigned except for Robert Iler. 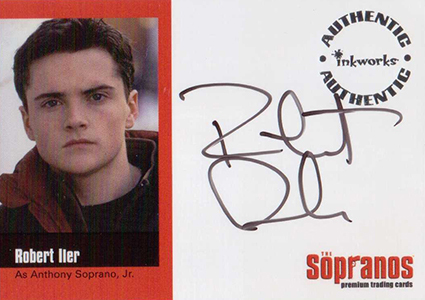 A-RI Robert Iler as Anthony Soprano Jr. 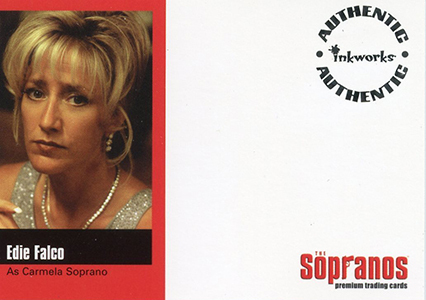 SOPRANOS UNSIGNED AUTOGRAPH CARD INKWORKS RARE DRE DE MATTEO "ADRIANA"
SOPRANOS UNSIGNED AUTOGRAPH CARD INKWORKS RARE STEVEN R SCHIRRIPA "BACCALIERI"
SOPRANOS UNSIGNED AUTOGRAPH CARD INKWORKS RARE DAN GRIMALDI "PATSY"
SOPRANOS UNSIGNED AUTOGRAPH CARD INKWORKS RARE EDIE FALCO "CARMELA"
DVD MOVIE SEALED NEW "THE SOPRANOS SEASON 4 BOX SET "